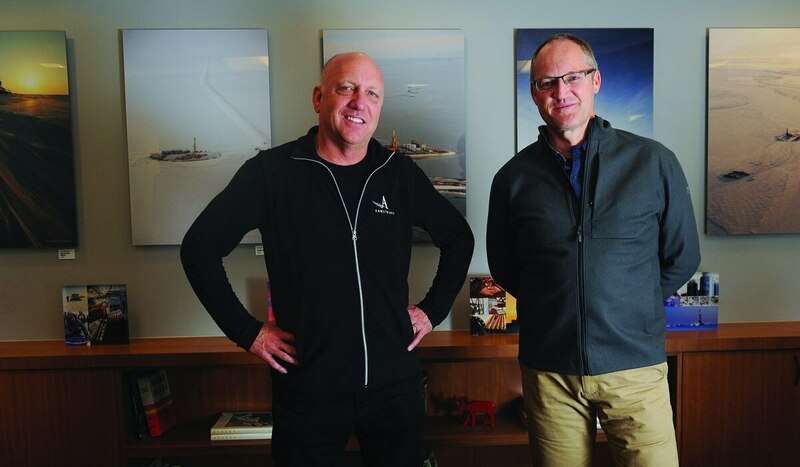 What companies are calling a “renaissance” at Alaska’s North Slope oil fields can be traced back to a 2013 discovery by a small-scale geologist willing to take big risks. Bill Armstrong is credited with finding massive quantities of oil in an overlooked rock formation, tucked between producing oil fields, on the western side of North Slope development. The discovery in the Nanushuk formation has been hailed as one of the largest onshore finds in the U.S. in decades. The Nanushuk, a relatively shallow rock formation created eons ago as mountains eroded, is now the rage as oil companies hunt similar opportunities in those rocks and others. “It’s a game-changer,” said Mark Myers, former head of the U.S. Geological Survey under President George W. Bush. Geologists had failed to spot the formation’s potential for decades, as they sought oil in deeper, more obvious prospects. Myers was one of them. In the late 1990s, he was senior staff geologist of exploration at Arco Alaska. Arco, drilling a well in 1995, just “nicked” the Nanushuk formation, Armstrong said. Analyzing oil from that well, Myers saw a “small, thin column” from the Nanushuk interval. It was “distinctly different” than the oil Arco sought in a deeper reservoir. “I’m saying, ‘Whoa, that’s really interesting,’" Myers said. It was a strong “exploration lead," something to chase, he said. But it was one of many opportunities Arco was pursuing at the time. And then a collapse in oil prices dented profits — and the industry’s appetite for risk. Ownership on the Slope shuffled. In 2000, Arco Alaska was sold to Phillips Petroleum, later becoming part of ConocoPhillips. Myers became head of Alaska’s Oil and Gas Division. “I was chasing that play down when Arco folded,” Myers said. “Another two, three years, and a similar budget, and we would have had it." Armstrong said the 1995 well was maybe half a mile from hitting a sweet spot in the Nanushuk. “They were on the edge,” he said. Spotting the formation’s potential using 1990s seismic data wouldn’t have been easy, Armstrong said. The seismic technology today, with its detailed images of reservoirs, can help companies find subtle oil traps that exist in the Nanushuk. “But even still, with today’s new technology, it doesn’t just jump out at you,” Armstrong said. Armstrong, credited with two smaller but sizable discoveries on the Slope where oil is now produced, said the region was seen as a “played-out” basin in the years before the Nanushuk discovery. Armstrong, owner of Armstrong Oil and Gas, a small Denver company, said he lacked “preconceived notions” about where oil ought to be on the Slope. In 2010, he assembled leases on Alaska land and lots of seismic data, both new and old. He teamed up with Spanish oil company Repsol, and began drilling prospects. Oil Search is now the operating company moving the discovery toward development. Key to the find was having an explorer’s mentality, while big oil companies focused on developing their existing fields, Armstrong said. The opportunities Armstrong unlocked could extend beyond the Nanushuk, Myers said. Other large accumulations of oil could be waiting in similar formations sprawled across much of the Slope, he said. “It’s not a stretch to say there could be more discoveries, as you move to other areas,” Myers said. ConocoPhillips big Willow discovery in the Nanushuk, announced in 2017, followed in Armstrong’s footsteps after the oil giant decided to take a second look at opportunities in the region, a company official said. Joe Marushack, president of ConocoPhillips Alaska, said the company is frustrated it missed making the initial discovery. Last year, ConocoPhillips Alaska had what Marushack called his most successful drilling campaign ever. Among other successes, the company drilled three exploration wells that made new discoveries in the Nanushuk. For this upcoming drilling season, the company is focusing much of its attention on the formation.